For this hosta, I dug out and replanted my entire bed of hostas. It doesn't look like much now, but when it grows up, it will be quite large. It's a passalong that I got from my sister last spring. Unfortunately, I didn't have a good place for it last summer after I moved it it to make way for some miniature hostas, so it's been in a container until today. Oh, and the reason it looks all mangled? It was in a big clay pot, and when I tried to slide it out of the pot, the whole thing ended up root ball on top, which is wrong. But I'm confident it will pull through. If it doesn't, I'll just go back to my sister's and get another division. In spite of her concern that when I divided this last spring, I took the nicest division, I left her with TWO plants and even planted them in two different locations. She's got plenty to share. 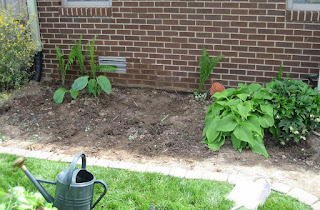 Here's the hosta bed right before I started digging. 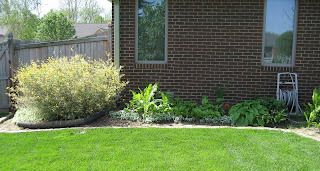 I did widen the bed earlier in the spring so I would have plenty of room for the Big Hosta. First order of business was to dig out all the hostas. I did leave two hostas that were more or less where I thought they should be, which is good because I thought the one on right was too far along to move this spring, anyway. 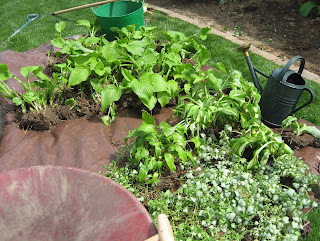 Here are all the hostas I dug from that bed and long with some variegated dead nettle (Lamium maculatum 'Beacon Nettle'). Dead nettle is a terrible name for an innocuous little ground cover, don't you think? And now, fast forward through amending the soil with bags of top soil, raking it all smooth, dividing and replanting the hostas, watering, mulching with cocoa hulls (remember, poisonous to dogs!) and watering again to get this finished bed. I promise that little tiny hosta with all that room around it is going to get really big. It's going to be a show stopper! And here are the leftovers. These are primarily some basic old fashioned "August Lilies" that I got from my brother and sister-in-law and moved from my last house to this one via another friend who let me plant them in her garden temporarily. I believe I've had these for about fifteen years. I found places to plant the leftovers at my neighbor's. I promise, none of them ended up in the compost bin. I am thrilled. I happen to have the day off tomorrow, and the day after that, and the day after that... the whole week! Looks like the weather is cooperating. I think I'll dig out the shrubs in the front garden bed tomorrow and plant them someplace else and then prep that whole front bed to plant something else there. Won't that be fun! But I'll need to be careful and quick about it, because right in the middle of that bed is a crabapple tree with this robin's nest with four eggs in it. Mama bird does not like it when I am around. She'll be squawking at me the whole time. I believe you about that hosta! I've got quite a few of them, and they are amazing, how they grow in a season, even the minis! Your bed looks lovely, and I can see just how much work that was for you. I have the next two days off, too, and I just know by Wednesday, I will not be able to move. Maybe even before then. I worked all day outside planting today, and I've got so much yet to do in regard to cultivating and putting down new mulch. Looking good! 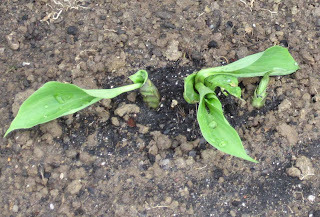 Hostas can spend the winter upside down in the compost heap and send out new shoots. I know yours will survive! The bed looks great. Immediate satisfaction! Also, love the nest with the eggs. What did you have to do to get that picture? P.s. Yes, dead nettle is an abominable name for a lovely little plant! Not dead and not really a nettle! What a beautiful robin's nest. How I wish robins would nest here in the spring too, rather than flying off to cooler places. The robin's eggs and the dead nettle (that's a terrible name!) are really beautiful. And you're doing a ton of work in those beds -- I'm so impressed! It looks great, and I can't wait to watch the hosta grow. I love your hosta. I am going to encorporate some into my shady walk path garden. If your lamium is "dead nettle" is my false lamium "false dead nettle"??? I agree with you guys...I don't like the name. The photo of the robin's nest is the best. Please share with us if you happen to get some photos of the baby birds. Have a great day tomorrow! Kylee... Yes, I'll be sore, but it is a good kind of sore, after gardening all day. Layanee... To get that picture of the bird's eggs I snuck up under the branches of the tree, carefully stood up so I wouldn't hit my head, then held the camera above the nest (and above where I could see) and snapped the picture. That is the 1st and only picture I took of the nest. Genie... I'll take more pictures of the hosta bed later in the summer. How lucky to have a Robin's nest. Those eggs are so beautifully blue they almost don't look real. Mother Nature knows how to do it right. :-) Good luck planting around Mama Robin. Hopefully she'll figure out that you're a friend. 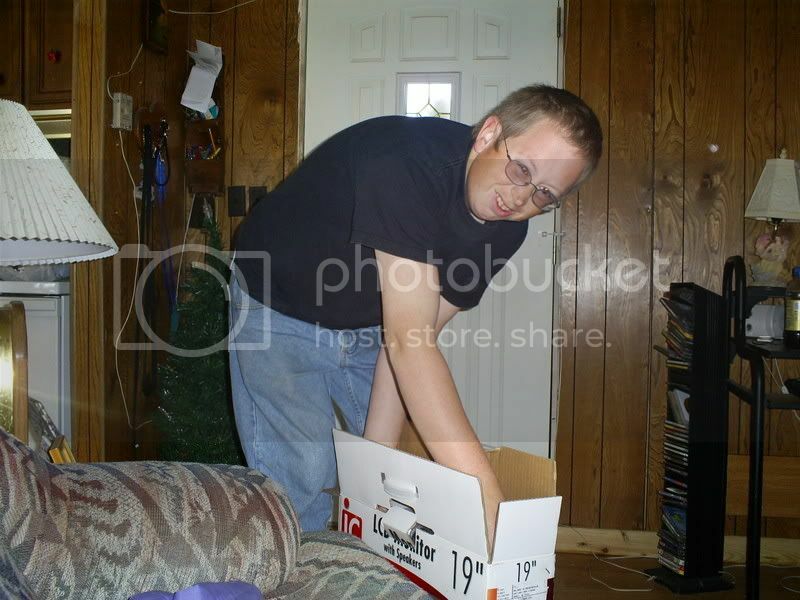 Gardenmama(Chris)... So if false lamium is false dead nettle, it must be live! I will try to take pictures of the baby birds later on. Mama bird will not be happy about it, but I'll do it anyway! Dawn...Mother Nature does do it right. I know now what "robin's egg blue" really looks like! Mama bird will have to get used to me because it is going to take some time to dig those shrubs out. You have been quite busy already. I love the picture of the robin's nest! It is beautiful! What a lucky neighbor you have to be the recipient of your hosta. 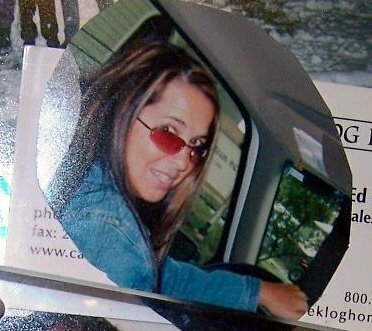 Michelle... Thanks for the nice comment. 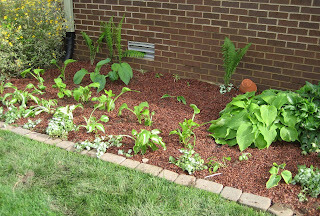 You can stop by my blog later in the summer, as I'm sure I'll have pictures of the hostas blooming. Robin...My week is just beginning. I am heading out now on this cool sunny morning to get to work. Days like this are wonderful! Sunnny & cool, yesterday the high was just 71, so I didn't even sweat replanting all the hostas. Carol — Excellent work with the hostas. I'm looking forward to seeing the progress of the big boy. And thanks for giving us a look as those lovely blue eggs. You've worked hard I see but it's looking good now. Love that Robins nest, the eggs are so pretty. 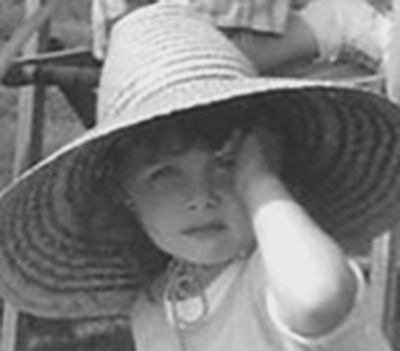 Have a nice garden holiday with lots of lovely weather! BTW it's raining here, at last!!! Garden Week is an exciting time to visit your blog, Carol. It's always so much fun to move the plants around and then anticipate the way they'll respond and grow in the new location. The scent of the August lilies will be your reward! Yes, Austin can't have everything - some people claim to make hostas grow here, but what I've seen bears little resemblance to the huge and lush hostas that grew in IL. A few of my special babies like 'Sum & Substance' went to friends' gardens before I left. All I have here is a small 'Golden Tiara' that came free with some order. Between the humidity, the slugs and the pillbugs, it's just pitiful, so thank you for the photos of your Hosta Horticultural Holiday. I was just noticing the "Mother hosta" to your hosta last night, and bemoaning that it looked sort of pathetic this year, but after seeing the picture of yours at this stage of the game, I feel much better! Glad you're having perfect gardening weather. You've been rained out several years in the past I know. everything is beutifull. 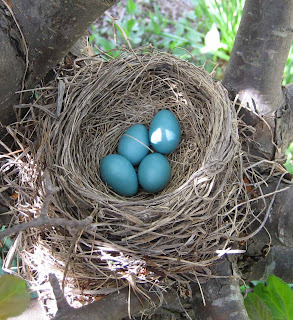 The robin's eggs are a pretty blue. Love all the plants. 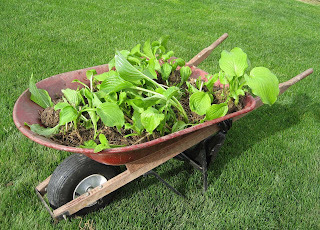 I am going to be putting together a Hosta garden. Can you tell me what type of other plants and or ground cover would look nice. Very Very shady area. Denise... I do not have a very, very shady area. But other perennials that do well in shade include astilbe and toad lilies. I also like impatiens as an annual to add color. Sometimes with shade it is not only the lack of light but dryness that keeps plants from thriving. You may have to water if the ground is very dry.